Futek has released a new range of load cells recommended for use in the weighing of medical bags such as IV or saline bags. In such applications, high-precision, in-line load cells are needed. Futek’s LSB200 Jr. miniature S-Beam load cells are designed to measure the tension force applied by an IV bag. Medical systems such as dialysis machines or patient monitoring devices often use test and measurement products either within the machinery or for quality testing. In the illustration above, Futek’s LSB200 miniature S-Beam Jr. load cell has been mounted to the fixture frame of the IV bag weighing apparatus. By utilising a LSB200 accessory hook, the IV bag can then be anchored to the load cell. The LSB200, equipped with built-in overload protection, will then measure the tensile force applied, streaming the data to any of the following instruments: IAA amplifiers, IHH500, IPM650 or USB solutions. When working with either of Futek's digital displays or USB solutions with SENSIT Test and Measurement Software, technicians can use the available options to record results, and log and graph data. 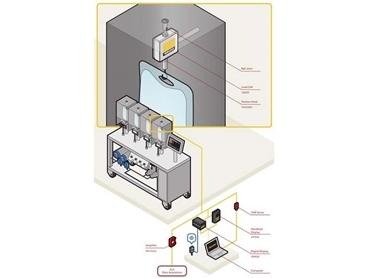 Products in use in this illustration include the LSB200 miniature S-Beam Jr. load cell paired with instrumentation (IPM650, IHH500, USB solutions, or IAA amplifiers). FUTEK Advanced Sensor Technology, Inc. is represented in Australia and New Zealand by Metromatics . For further information, please visit the Metromatics website, www.metromatics.com.au or call (07) 3868-4255.